On Auckland Anniversary Weekend, Auckland Harbour Bridge was transformed by the launch of Vector Lights—featuring a renewable energy technology powered light show that ignited imaginations and demonstrated a smarter way to power the city. The installation was designed, managed, installed, and programmed by Sydney-based design and production company Mandylights, vividly demonstrating the new lighting capabilities and a smarter way to power Auckland as part of a ten-year smart energy partnership between Vector Limited and Auckland Council. The audiovisual performance is made up of three chapters—the first references Tama-Nui te Ra (the sun), the original source of energy; the second Hikohiko (electrical energy) representing it as energy and technology, and the final Hei te Ao Marama (the future world of light) as an acknowledgement to the diversity and culture in Auckland. Vector was looking for a way to illuminate the Harbour Bridge in a highly energy efficient manner. Plus, the design had to be sympathetic and able to communicate New Zealand ideals and values. Mandylights spent a lot of time looking at the physical architecture of the bridge. One of the first things Neville did was fly to Auckland to spend a night sitting in various locations around the city taking in all aspects of the structure. He imagined ways to accentuate what is already there, especially the unique structure of girders that sit under the road. Environment was the biggest challenge for Mandylights, located in the middle of the harbor, with the crew getting blasted by winds in excess of 40 miles an hour. Add to that salt spray, and in some locations, the fixtures are only 19 feet away from the water. Mandylights faced logistical challenges during the install. The outside lanes of the bridge were added after the main structure was built in 1959, with the four clip-on lanes added in 1969. In a matter of seconds, this road deck can move by up to three feet as the load on the road decks above change. Another technical challenges was access—many of the places where lights were installed were incredibly difficult to get to. Rise Pacific, a specialist rigging company from Sydney, designed and built a completely unique access system to get the Mandylights crew specifically to where they needed to go. During the lighting installation, the whole bridge power system was being reconfigured to run the bridge off a solar and battery grid. From the beginning Neville was clear that he wanted to light the Bridge with three types of LED fixtures in three very distinct styles. A wash light was required to light the internal structure of the bridge, a linear strip to outline the entire exterior perimeter of the structure, and finally, an LED dot fixture for the 170 diagonals and verticals under the bridge. 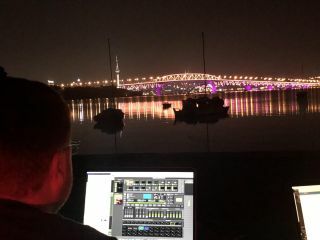 Mandylights looked at a few variations of applicable LED fixtures, but found they gravitated towards Martin by Harman due to the reliability of product and the incredible support offered by Harman Professional Solutions country partner, Show Technology. All of the Martin equipment runs off the Martin P3 System Controller, which is fed video by two media servers. The entire system is controlled by an MA2 network so at every distribution board installed on the bridge, there’s an MA2 4Port Node; additional Nodes are in the control room. The bridge lights can be remotely managed by Mandylights.